« A Tesla Powerwall for Up Hill House? 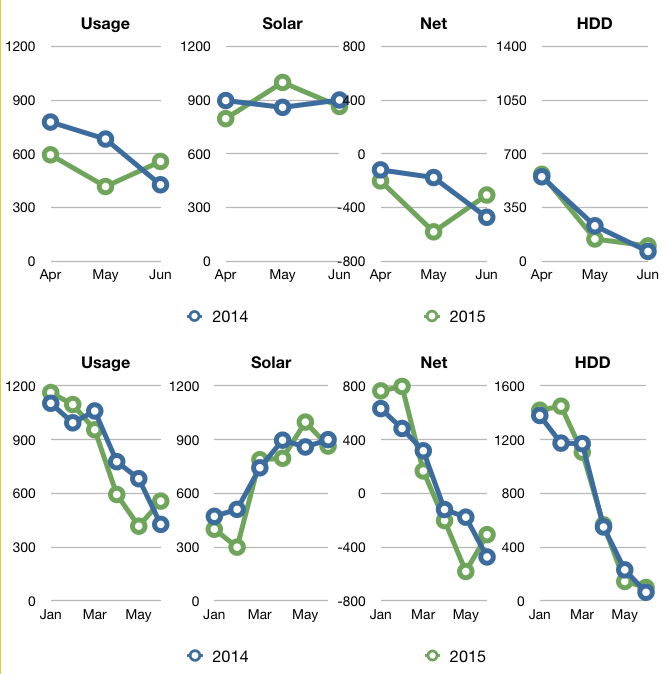 Q2 2015 summary: 4% cooler, 17% less usage and 2kWh more sun as compared to Q2 2014. It is a wet, foggy and cold July 4th at Up Hill House. Perfect weather to update our quarterly numbers! And like today, this quarter was fairly uneventful. In energy terms, however, that is not a bad thing for us. The last day we used heat was April 28 for a total of 151kWh this quarter. Last year we turned the heat off on April 5th and used 33 kWh that quarter. We used a total of 2,200 kWh for heat for the winter of 2014-2015. At $0.15/kWh that’s $330. 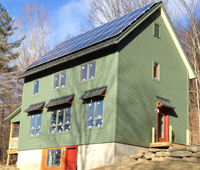 Last winter (13-14) we used 1,804 kWh or about $271. In the winter of 12-13, we used 957 kWh or $144. We’re 637 kWh short of netting out for the year. Last year we netted out around mid-July. In years prior we were net positive by May or June. Our water usage is down 13% from Q2 2014. I believe this is due to the short burst of summer-like weather in May and June. The warmer temps persuaded us to plant the garden a week earlier than usual, but then we lost most of the seedlings from the heat and lack of rain. We had to replant later in June. So while our region was suffering from unseasonably warm temperatures and a lack of rain, we had no garden to water.